This is good to see. I’m always happy to hear of a great Linux app being ported to Windows instead of the other way around. Evolution is more like the MS Office you’d see in your office, rather than the Outlook + Word/Excel/Powerpoint you’d purchase (cough, cough) for your home PC. Be sure to read the comments over at LifeHacker. Evolution for Windows is still, er, evolving. I covered iubo briefly over at eHub and now DLS has a nice write up plus 250 beta invites to give out. Share your WiFi with others in a safe and secure way, and in return, get free WiFi everywhere. Free webapp Goldmail gives those not willing to shell out for a package like Soundslides a dead-simple interface for creating and hosting slideshows with audio narration. I’m pretty intrigued by this app. Depending on how it works, you may see this popping up later on some of my reviews. What If BookBump Was In The Classroom? This looks like a really cool app and I’m excited to try it out! This is great for personal use, but what if it were adopted by an organization like a grade school or a local library? Given the iTunes parallels, young folks would latch on very quickly; even a solitary teacher with a single classroom of students could do amazing things with this app. Jimdo gives you the tools to create a custom website, and it’s as easy as clicking anywhere on your page and adding text. That’s not all though. Jimbo looks like a good tool in a saturated market. Demo Girl’s screencast is excellent, as always. Last Friday, I was fortunate enough to spend some time speaking with Daniel Ha of Dispus . Disqus is an advanced blog commenting system, and Daniel was nice enough to give me a pre-launch tour. I’ve been biting my tongue, so to speak, because I was asked not to post anything before today’s launch of the public beta. This is the first page you see when you log in at Disqus .com. From here, you’ve got a number of options. You can join discussions (disqussions ?) that are already in progress. You can add your own blog to the discussion. You can create a forum. Or you can view and monitor comments you’ve made. Creating a new forum is dead simple. Choose an interesting title. Your forum gets it’s own permanent subdomain at yourforum.disqus.com. The look of your forum is completely customizable , so your forum can look exactly like your blog. The forum structure is also flexible, allowing you to add sub-topics and categories to your forum. 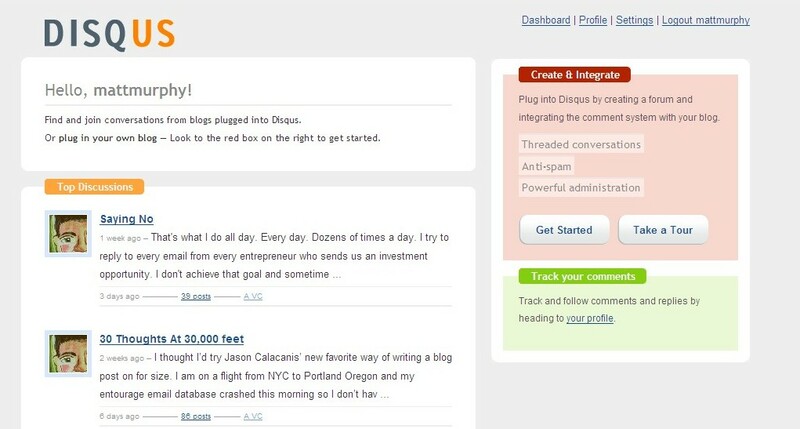 This is a shot of Disqus in action. There are a few things to point out here. First is anonymous posting. 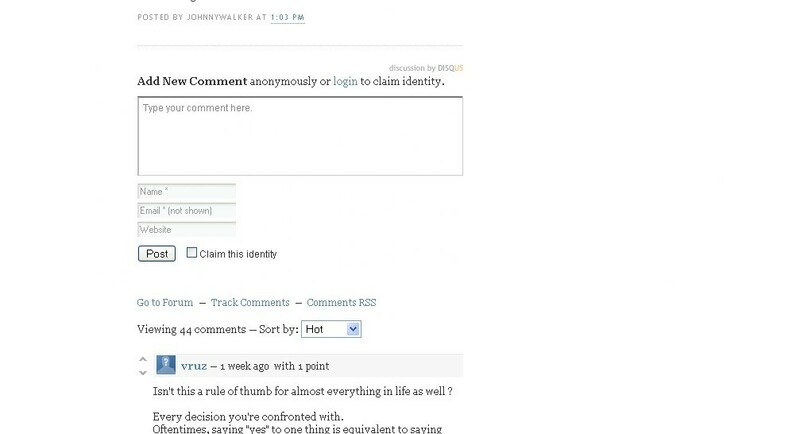 Anonymous posting is an option that is controlled by the forum owner. Also, the user can register without being distracted from their post. The menu below this allows you to navigate straight to the forum for this discussion. You can also sort comments. (As opposed to a traditional comment or discussion that you would view chronologically.) This is a really great touch because it allows you to keep on top of the parts of the discussion that are moving without wading through tons of dead end commentary. I should mention that what makes a comment “Hot” or “Best” is a user rating system. 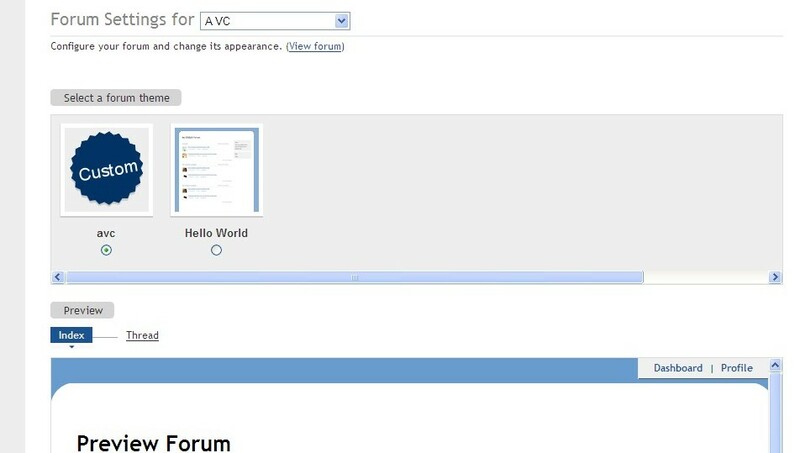 If you hover over a user, you are shown their current reputation. A user’s reputation carries across theDisqus network. This is Daniel’s user page. There a lot of things happening here. (Including one of the better profile pics I’ve seen!) This page shows how many people are following you and how many people you are following. You’ll see comments from friends in the Disqus network. This is basically micro-blogging type stuff, except it offers a lot more flexibility in how you interact than does, say, Twitter, in that you see everything that you or your friends post across anyDisqus forum from here. Daniel also walked me through a few things of the back side of the forum. Comments can be easily removed, active users can be assigned as moderators, and spam is killed by a double pass through their own spam filtering software as well asAkismet . Honestly, when I was first contacted about Disqus , I was a bit skeptical. I didn’t see a need. After having spent some time with their product, I have to say that I’m impressed. I like how micro-blogging is integrated especially. When I asked about the beta label, I was told that the only reason their calling it a beta is because they plan to just keep rolling out more features and making the product more robust. I’m sure that there’s a few features that Daniel pointed out that I didn’t go over here, so feel free leave any comments on my brand newDisqus forum. The folks at Jango are hooking DemoGirl readers up with access to the private beta. Jandgo is a social internet radio platform that lets you create custom radio stations and see what similar tunes others are listening to. Demo Girl does her usual thorough tour and the Jango folks are nice enough to let Demo Girl readers into the private beta. Plan a project or map an idea with Exploratree, a free online library of “thinking guides” you can either print out or use online. Cesar Castro posted this on eHub and I took some time to look around the site then. It’s pretty slick. There are customizable templates that you use to map out a problem or idea, and by using different templates that focus on different aspects of problem solving, different solutions rise to the surface. The amount of junk sitting in most people’s mailbox, and then invariably their trash cans is sickening. The other day, I got three different credit card offers in the mail. My wife got two. We also got two newspaper-like flyers full of ads for local companies, and an envelope addressed to my wife’s mother which turned out to be junk mail. And this was a pretty typical day for us. Most days, nearly every piece of mail we receive goes straight into the recycling pile. It’s the least we can do for the planet. It would be far better had that piece of mail never been shipped to us, never been labeled, never been printed, and never been cut for paper. It’s far more than the old adage, “Save a tree” when you really look at the resources that have been wasted as soon as you toss that paper in the recycling. The final slap in Mother Nature’s face is when that collection of wasted resources that some company hopes will convince you to apply for another credit card is simply tossed into the trash. I haven’t tried ProQou yet, and I’m not completely convinced that theirs is a revenue-generating business model, but I am going to try it out tonight. They claim a reduction in junk mail of 50%-90%. I’m not that optimistic, but any junk mail I’m not getting means resources I’m not wasting, and I’m happy about that.